Taulman3D is pleased to release “SAC1060”, a new Mechanically removable support material for Nylon 3D printing materials. ​SAC1060 is a mechanically removable (requires needle nose pliers) support material that works with all Nylons. This includes all of TAULMAN3D’s Nylons as well as Carbon Fiber Nylon and Glass filled Nylons. While SAC1060 Prints at 235C to 255C like higher temperatures of Nylons, it does not “melt into or weld onto” Nylons. It was developed to stick to all Nylons as a support material during the printing process, yet retain a mild adhesion at ambient temperatures. This allows the user to print high temperature base Nylons with a support material that does not warp or melt based on print temperatures. Use SAC 1060 for all Nylon Mechanically removable support needs. When required, you can also use SAC 1060 as a RAFT surface as well. SAC 1060 has a low tensile of ~ 2000 PSI and cracks easily. Speed = 50% of print speed. NOTE: SAC 1060 has not been tested with "single nozzle/dual material" printers but should work well as long as the above settings are used. 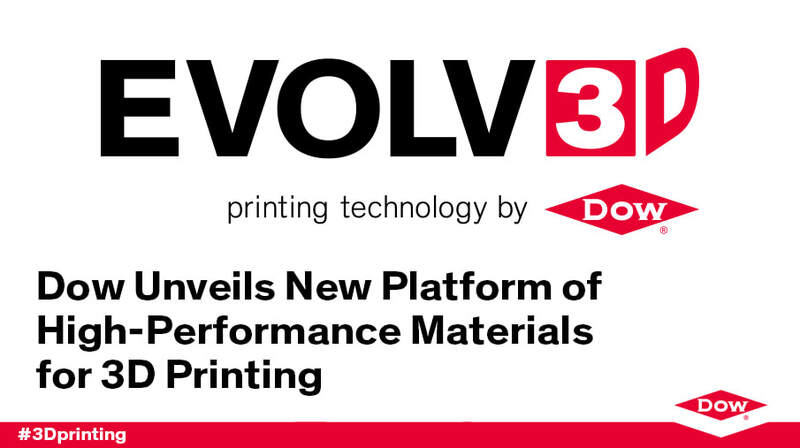 MIDLAND, MI – The Dow Chemical Company, a subsidiary of DowDuPont (NYSE: DWDP), is unveiling a new product series, the EVOLV3D™ platform for 3D printing. The EVOLV3D family was developed to address customer challenges for prototyping and manufacturing using 3D printing, and represents Dow’s entry into the growing 3D printing industry. The first product to be introduced is EVOLV3D™ USM (Universal Support Material). EVOLV3D USM represents a leap forward in technology, providing the ability to use a single support material for a broad range of popular build material filaments. This highly effective, water-soluble support material maintains its structural integrity during the printing process, enabling production of parts with large overhangs, intricate inner geometries and deep cavities. Dow is excited to collaborate with Taulman3D, a North American manufacturer and distributor of 3D printing materials for the anticipated commercial launch of EVOLV3D USM in early 2018. NOTE, Alloy 920GF, 960CF and PPEPS will be available again mid 2019 as they are extrememly difficult to mfg. 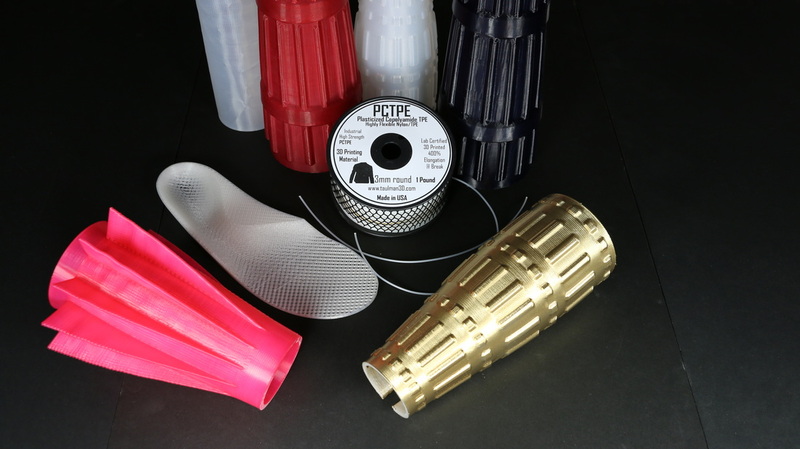 ​A high strength ISO 10993 and FDA Registered PETG based material. guidel!ne is sold as a raw material modified in form only into 3d printing line and most important, extruded in a manner that keeps contaminates out of the material during the cooling process, where contaminates and bacteria could be embedded in the soft extrusion. In addition, pH and ORP levels are monitored and adjusted to maintain acceptable levels. guidel!ne comes on 1 pound spools in either 2.85mm or 1.75mm round. guidel!ne is labeled with a QR code that provides a “trace-ability and batch key”. Each spool has a Identification number, comes vacuum sealed and ships in its own box. End users will be able to “register” their spool/s with taulman3D. As with other materials from taulman3D, the clarity of guidel!ne allows for visual non-destructive evaluation of the printed part. Recognizing a growing need for 3D printing materials with higher durability as well as unique flexibility, taulman3D and DuPont Packaging & Industrial Polymers (DuPont) worked together to manufacture and release a unique new flexible material to the 3D printing community called T-lyne that uses DuPont™ Surlyn® ionomer. T-lyne is a unique, crystal clear polyethylene co-polymer developed specifically for high durability, flexibility, unique viscosity and a wide temperature range. Glass-like aesthetics can easily be obtained at high layer sizes using low speed and low temperatures in the range of 190 C to 210 C. Utility style parts are easily printed faster at standard layer sizes using higher temperatures up to 245 C, depending on nozzle size. 6,000PSI Tensile and 3% Elongation when 3D Printed! IZOD Notch = 2.14 ft-lbf/inch. Approvals = FDA CFR 177.1315. Advanced New Material release from taulman3D. 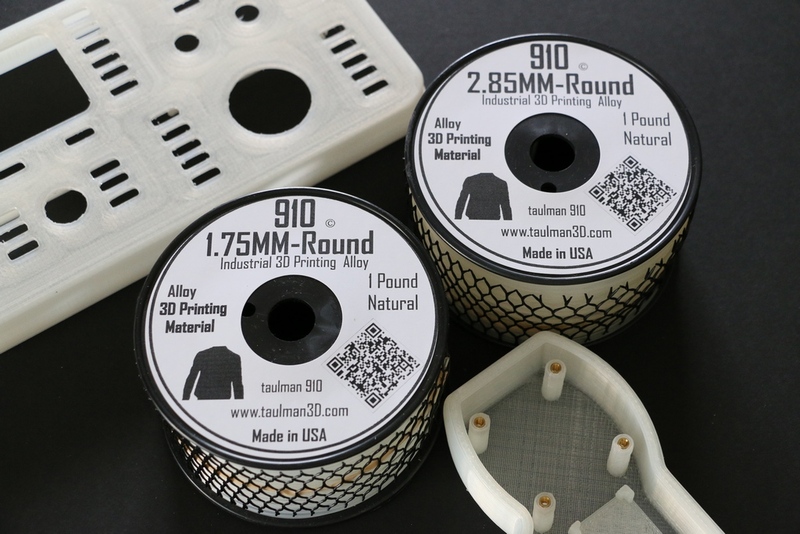 Alloy 910 is a measurable advancement in 3D Printing materials technology from taulman3D. 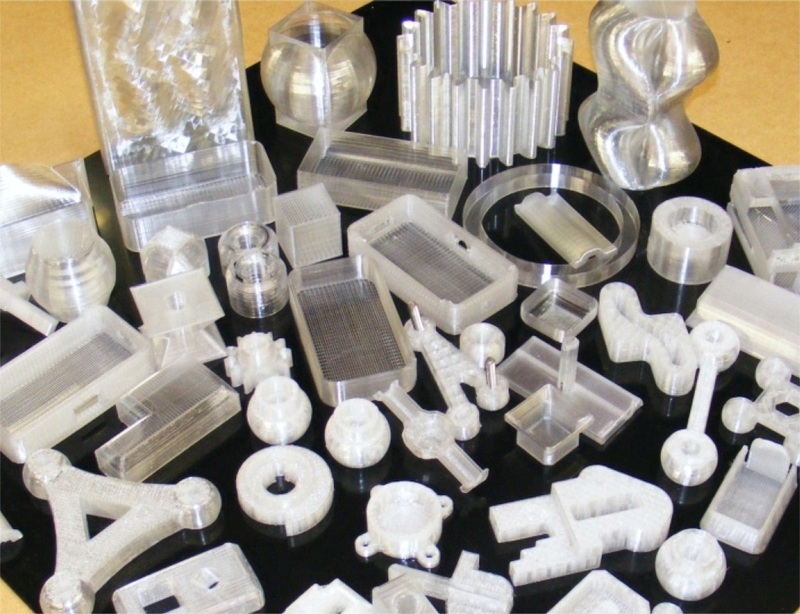 taulman Alloy 910 is the combined effort of chemical companies, extrusion manufactures and taulman3D to specifically develop a single material to meet as many high performance 3D Printing needs as possible. With a combined tensile strength higher than the strongest co-polyesters, the durability of Nylons, a shrinkage factor that rivals our t-glase, a vast range of chemical resistance and a 95C working range, you now have one solution easily printable at 250C. Color = Clear w/Subtle Amber - May be dyed with acid based dyes. Availability = 1.75mm and 2.85mm Material is on-hand and shipping worldwide now. "Drop Test Ready" Electronics Enclosures. Electronic Cover Plates and one-of-a-kind parts. Industrial Alignment bars, Positioning components, Spacers and supports. Designed from the ground up for Food and Beverage contact along with the extremes of Boiling Water, Steam and Dishwashers. 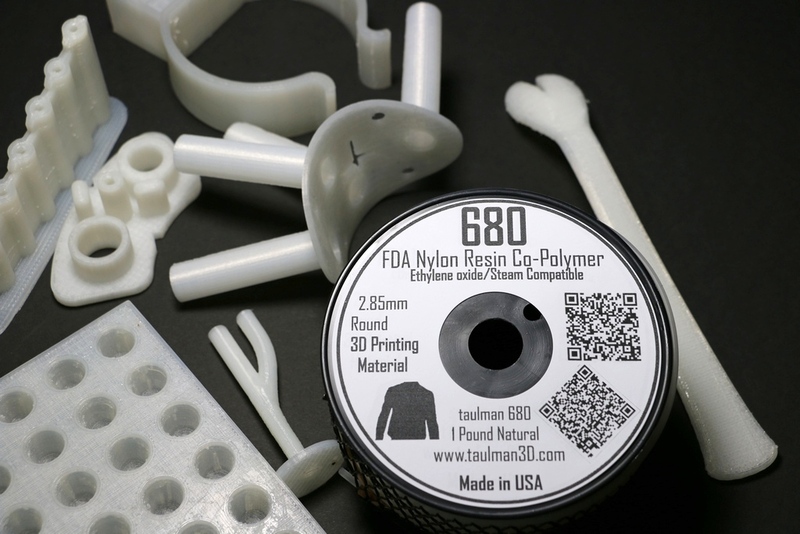 taulman3D and Graphene 3D Lab Inc. have teamed up to bring Nylon 680 to the 3D Printing community! Nylon 680 is at a minimum an FDA CAS Reg. No. 51995-62-1 6/69 Nylon developed and tested to meet 21CFR177.1500 / 21CFR177.1395. The first unique property of Nylon 680 is it's specific development for FFF 3D Printing. 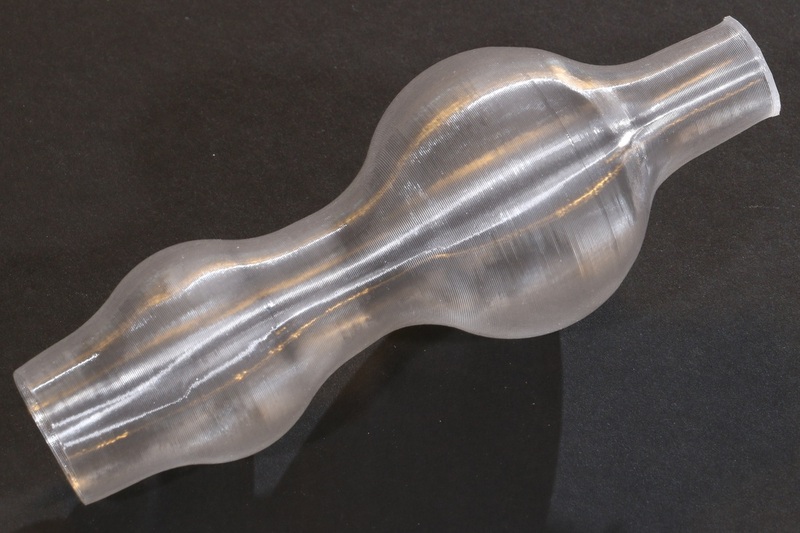 Commodity FDA nylons are prone to a phenomena known as "clumping" or inconsistent viscosity during the 3D Printing extrusion process. This inconsistent viscosity will always leave 3D Printed parts with random gaps and in some cases loss of bonding contact to the previous layer. 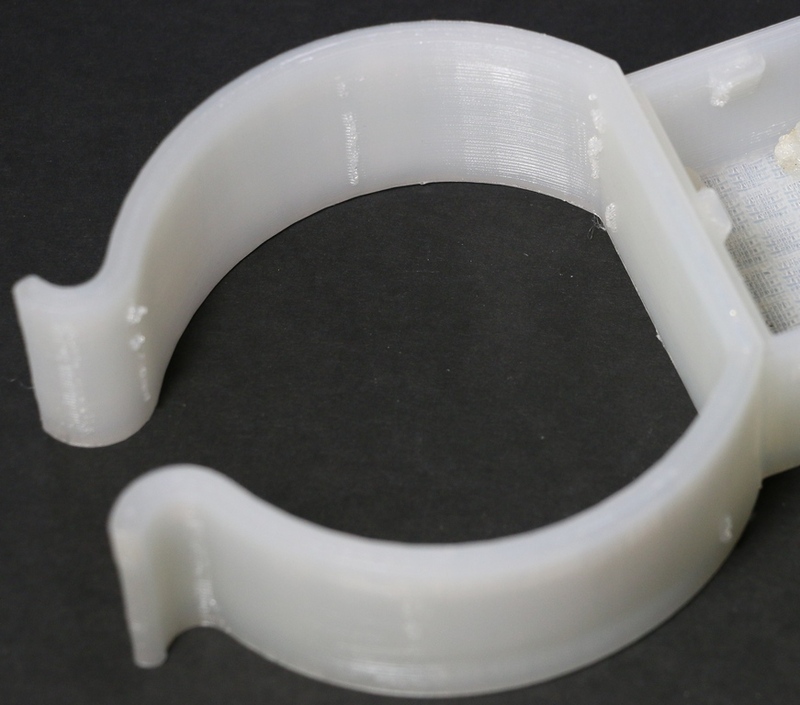 Nylon 680 is specifically designed to completely eliminate this problem, making the 3D Printing process as seamless as printing many other polymers now in use. The next major improvement comes in Nylon 680's ability to handle the high temperatures of boiling water, steam and dishwater usage. While some nylons will deteriorate to the point of being unusable, parts made of Nylon 680 can stand insertion into boiling water and only need to be dried to return to use. For manufacturing or conversion from pellets to 3D Printing "line", another feature of Nylon 680 is that it is not extruded, but "drawn" and done so, under water. The water in the draw process is maintained and continually refreshed to have a pH of ~7.0 - 7.2 and an ORP greater than 600mv. From the draw process, the material is down spooled by machine and delivered to the taulman3D facility where each spool is checked, labeled and vacuum sealed. Spools are labeled on both sides and contain 2 QR codes. One code for printing information and the other denotes the manufacturing batch code/date of mfg. 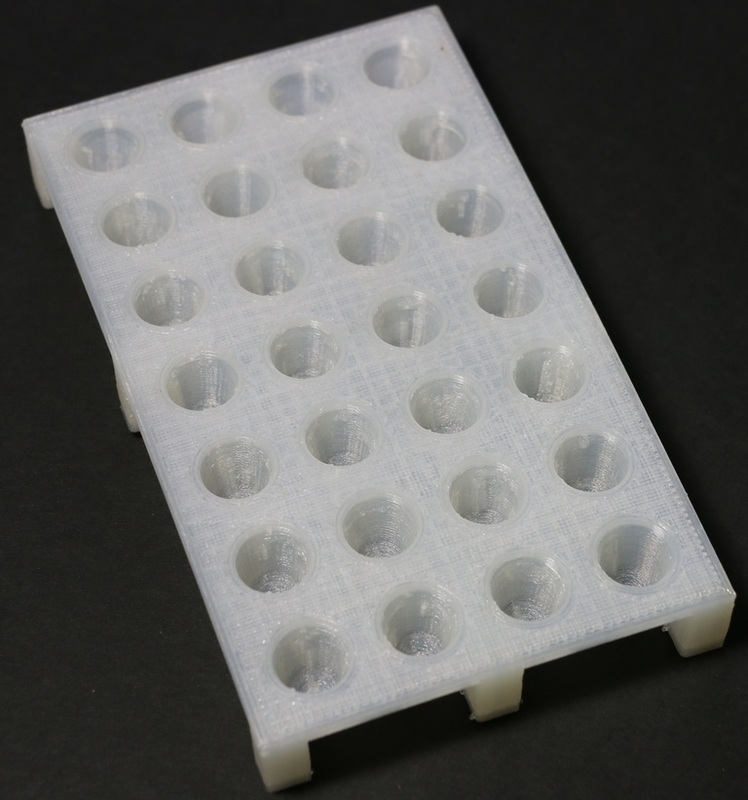 For quality control of 3D Printed parts, Nylon 680 is very transparent and allows for easy non-destructive evaluation on a light table. 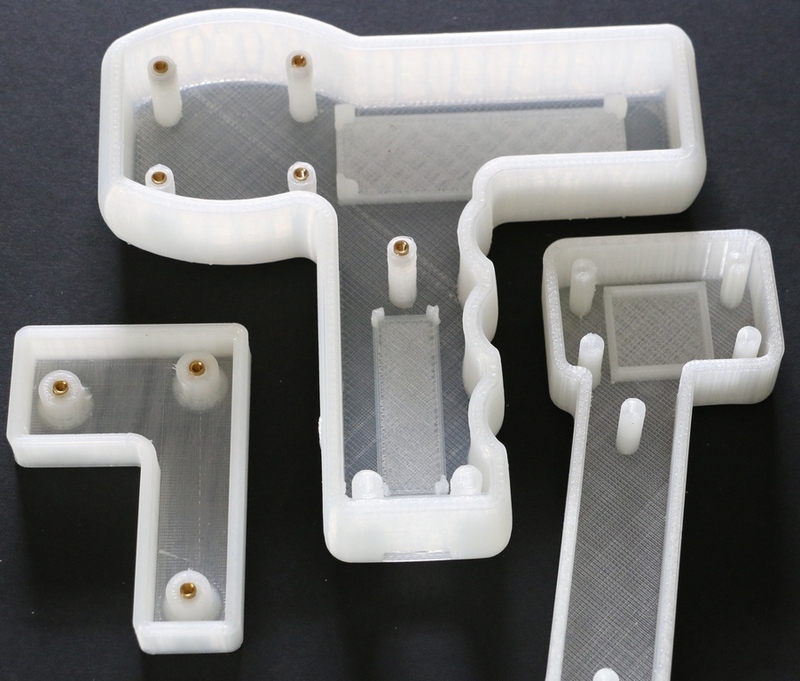 One of the most important quality requirements for 3D Printed parts is the correct adhesion of the internal fill material to the inside wall of the inner most perimeter. When a printer is operating too fast or it is running at a lower than "set" temperature, the fill will not properly adhere to the internal perimeter making for a part that may appear to be correct, but instead be defective. The only way to test for this is to do a destructive test, unless the material is transparent enough to allow for visual inspection on a light table. NOTE: The specifications below are the results of actual 3D Printed Tensile test bars that have been placed in boiling water "~100C" for 15 min. Then forced air dried for 12hr's at 15% humidity, sealed and sent to the test labs. Parts "NOT" placed in boiling water will have a higher Tensile and lower Elongation. 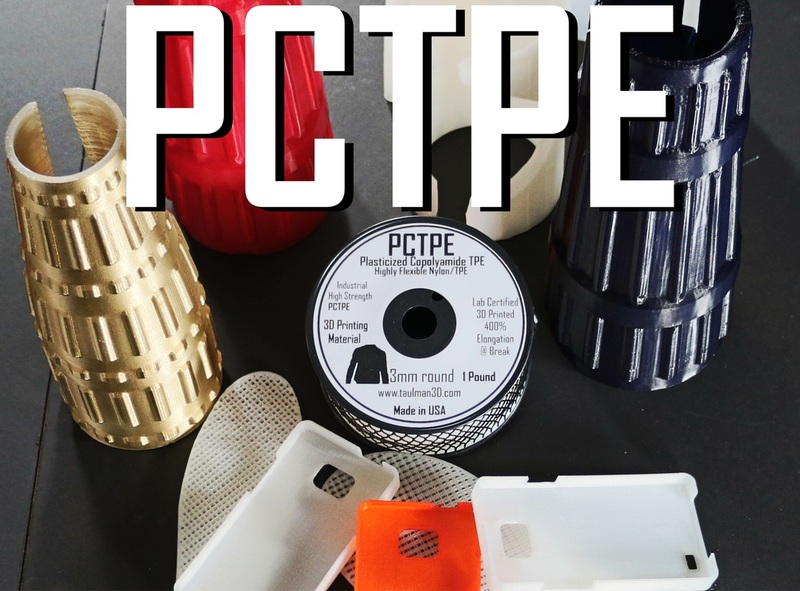 PCTPE is available now in both 1.75mm and 2.85mm round 1 lb spools. The main goal of taulman3D has always been to provide the designer, engineer, hobbyist, inventor and artist with the strongest material available for their FFM 3D printing needs. To meet that goal is not just to provide the best, but to also insure access from the largest industrial customer to the young student in his or her garage. Today's young designers are printing their ideas. With high strength materials, they will soon be printing Robots.....and these robots won't be the "Wind-Up Toys" of the 1950's! Looking back through our materials releases, it was just last October that we released a completely new material to the 3D Printing community, 618 Nylon Co-Polymer. 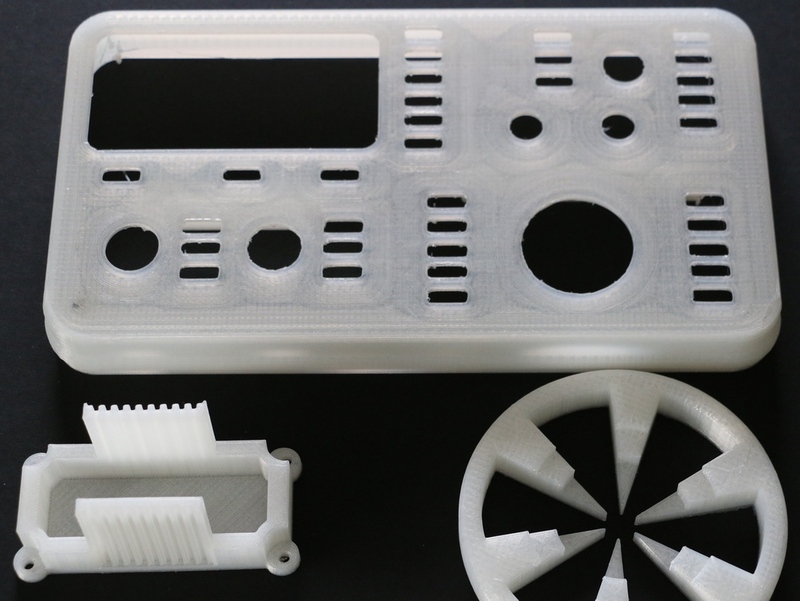 Growing from a single web store to a list of major resellers around the world in just 6 months, is proof that 3D Printer operators were quickly convinced 618 meets their need for a high strength material. The community should know we are even more committed to bringing high strength lines to users everywhere and realize that without the feedback from you, none of this would be possible. 618 nylon was just followed up in May with the new true industrial material. 645 nylon, a very high strength line with additional features specific to industrial use and quality control. 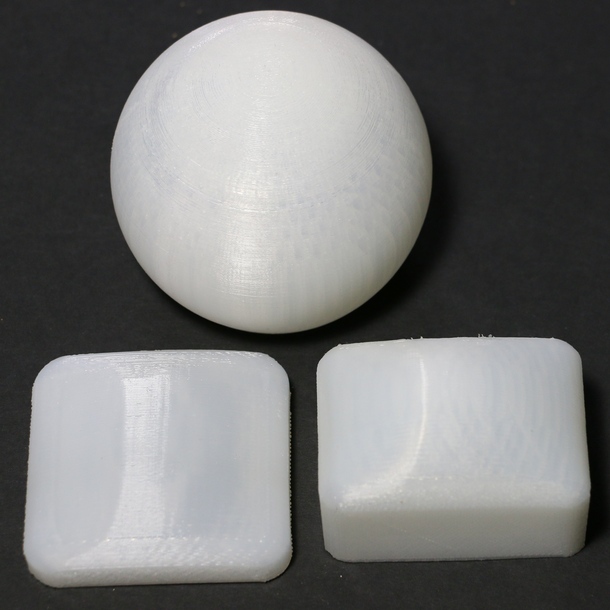 Today, taulman3D has released another high strength material. 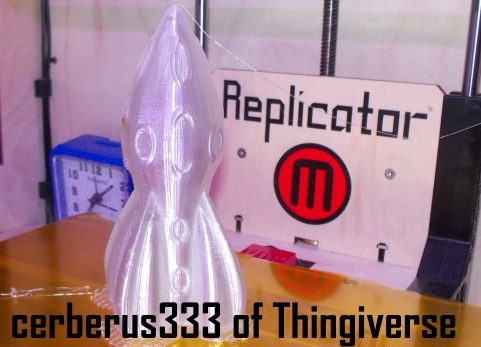 One for those users that print mostly with PLA or lower temperature 3D Printers. This new material is called “t-glase” (tee glass) short for tough glass. As a side note, t-glase was actually released to our local testers as “taulman 810”, however, it soon became known among our local testers and a few industrial customers as t-glase, so we kept that title. 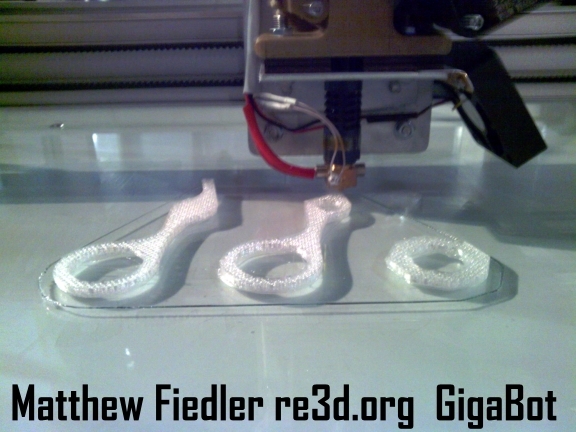 Like 618, t-glase started with requests from you, the 3D Printing community. We initially released 618 in 3mm and things moved along very well. 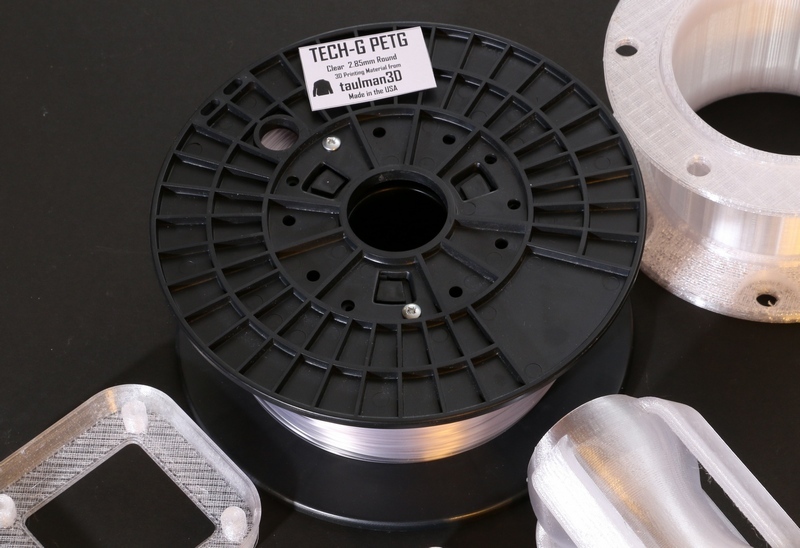 When we released 618 in 1.75mm a month later, we started to receive emails from users around the world that were using PLA and/or printing at lower temperatures. With an understanding of our processes, it was actually our chemists that came back to us and suggested we try a polymer known as PETT and introduced us to one of the world’s largest mfg of PETT components for industry. While printing in various types of PET isn’t new, we decided to work with the strongest of the PETT polymer combinations available. Most of us have seen a similar polymer in the form of clear high strength water transport containers. These are known to be extremely tough and resistant to breakage. Then the chemical company and manufacturer worked together to make us some evaluation line. With a few industrial customers along with some local operators, t-glase quickly went into testing. Within just 15 days, we gave away free for testing or sold the entire 124kg of available t-glase. Our goal now is to open t-glase for pre-sale to the 3D Printing Community. Temperature - Optimum temperature is about 235c to 240C. Environmental - While t-glase is not compostable like PLA, it is a material that’s considered 100% reclaimable. Thus the new “struders” that convert failed prints back to usable line work perfectly with t-glase. If you have a “struder”, you can actually mix in 12% of the total weight in discarded clear water bottles. 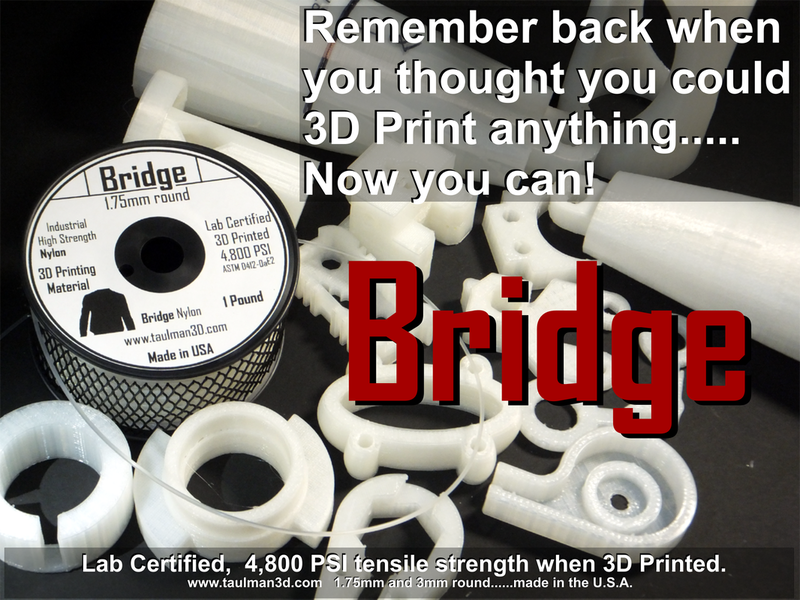 Bridging - Those of us that have printed with acrylics and poly-carbonates are always envious of their bridging capabilities due to glass temperature. And the new t-glase is very impressive at bridging. t-glass comes in “Clear, Red, Green, Blue, Aqua, Black and White”. Below are just a few of the comments from some of those that received evaluation samples of t-glase. We love the new T-Glass material. 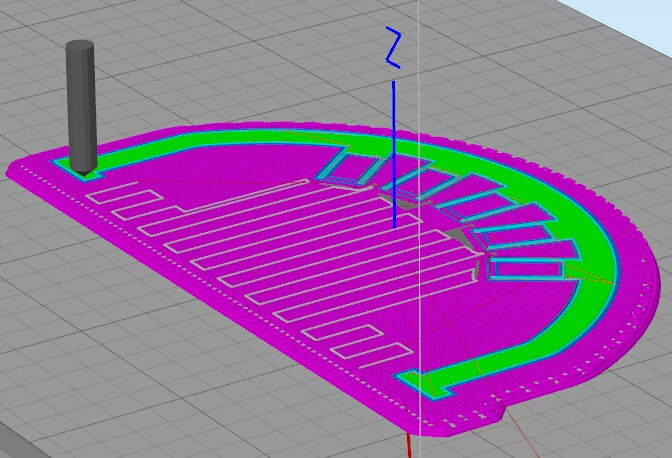 It was extremely easy to use with our Makerbot 2x. and the print was hassle free. It took about 2.5 hours to print this piece. Thanks to this new FDA approved material, we can now manufacture items for an entire new market. It opens up a world of possibilities for us. I can't wait to get a hold of more! We've been developing our own 3D printer, the Helix, for the last couple months. to warp during printing which in unacceptable in a high precision part. I printed one car in T-Glass as a test and sure wish I had enough test material to print them all that way. For production, we will use aluminum cars, but for prototyping the T-glass car is far superior to ABS. on the rails. For high precision parts, we won't be using ABS anymore. 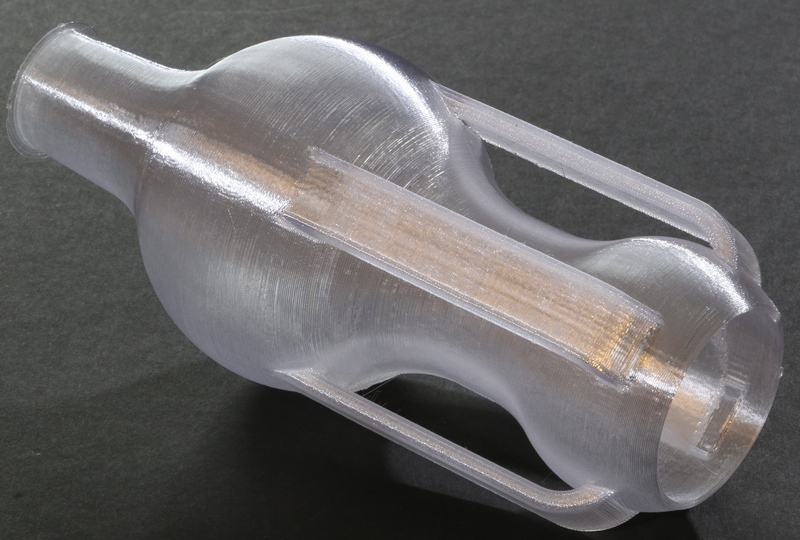 "The new taulman T-Glass has the ease of printing of PLA, with the strength that the Taulman products are becoming known for. I have been experimenting with many different and new materials and rarely have I come across something that just prints without any additional setup or fiddling. I was able to have great prints on my MakerBot Replicator 1 with stock extruders and blue painters tape on my bed from the very first print. For those with a Replicator 2 or other printer without a heated build plate, the materials options are very limited, but T-Glass will bring a new level to your prints. Standard PLA is brittle and not a great material for usable prints, but T-Glass brings the strength back to your prints. The optical quality of T-Glass prints is unlike any other filament on the market. At higher resolutions it has a brilliant luster and at low resolution it becomes almost transparent. Taulman T-Glass will be joining my list of favorite filaments." re:3D and Gigabot found the Taulman t-glass very easy to start printing with. The clarity of the filament is amazing and the durability of the material seems to be very high with our initial test. We see it as our task to build an industrial quality machine and the Taulman t-glass is a great complimentary industrial material. 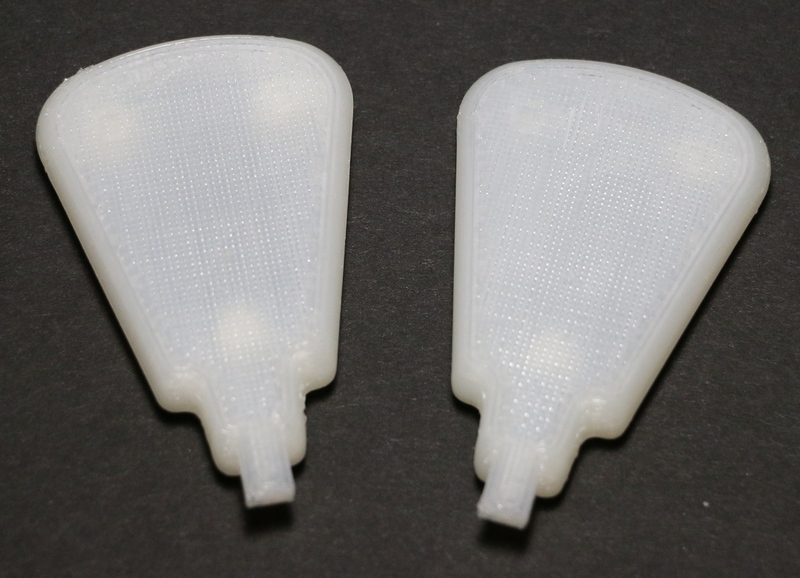 "John Porter, President, 3F Product Design Inc., Canada"
"We have been using the Makerbot 2X with a variety of materials, and the T-Glass is some of the best printing material we have ever used. It's lower print temperatures, layer bonding, and strength are great, and almost no shrinkage means prints stay flat, allowing them to stay much closer to design tolerances than ABS, or PLA. Having an FDA approved material to choose from will offer our clients better options, and more possibilities for prototyping."